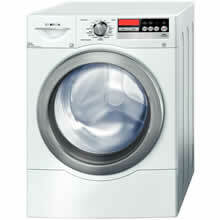 WFVC8440UC is a washer from a well-known household appliance manufacturer, Bosch. This unit has a dimension of 36 8/10'' x 27'' x 29 7/10'' " and weighs 227 lbs . This washer has a capacity of 4.4 Cu Ft and costs $ 1,549.00. EcoSmart Technology - This system features intelligent network of sensors to boost the unit's efficiency. Through this, your workload will be reduced. EcoAction Option - This feature reduces the consumption of energy by up to 20%, reducing your monthly bill in the process. ActiveWater - Helps you save large amount of water. 15 Wash Cycles - Allows the thorough washing of various load types. ActiveClean feature - Ensures the thorough cleaning of the laundry. Comforter Cycle - This makes sure the efficient and thorough cleaning of bulky items such as comforter and thick blankets. ActiveWear Cycle - This provides maximum care for sports and exercise clothes. Allergy Rinse Option - This prevents allergy by removing the traces of detergent on the fabric. Dark Colors Cycle - This feature is designed for clothes with dark colors. This feature prevents the colors of your clothes from fading. Wool/ Handwash Cycle - This one ensures the gentle treatment of sensitive and delicate fabric. Drain/Spin Cycle - This feature is made to drain and spin moisture from the materials. AVS Anti-Vibration System - Ensures the silent and smooth operation of the machine. Consumers have different views about this product. One of the best things that consumers like about this product is the fact that it is NSF Certified. The washer is guaranteed to kill 99.9% of household bacteria that clung on the clothes. With this unit, you don't have to worry about major water damage because this unit has leak protection system. This unit kills bacteria and also removes traces of detergent, making this one ideal for washing baby clothes. Another great thing about this model is that it exceeds the Federal Energy Standards by up to 102%, ensuring this model's energy efficiency. If you use this washer, you can save energy. The unit also ensures thorough cleaning of the clothes through various cycles and other smart features. Another impressive thing about this item is that it operates smoothly and silently. With this machine, you can even do your laundry at night when your baby is already asleep. One of the drawbacks of buying this product is the price.For a washer, this costs too much compared to washers from other leading brands. The design is also a major drawback for those who take aesthetics as an important consideration. This unit is available in white color only.